I’ve always been annoyed with the way Live disappears the MIDI out menu of a track the instant you drop in an audio effect or instrument. 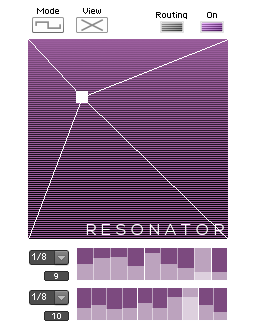 It makes it difficult to route Reaktor’s awesome Spiral instrument, for example, to another instrument track. Or to send LFO controllers from Reaktor to an instrument. You can do it by selecting the Reaktor track as the MIDI in on the destination, but then you lose the ability to also control the instrument from a keyboard or control surface. 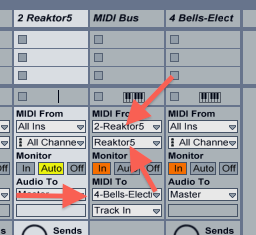 Notice that the MIDI Bus track has its inputs set to the Reaktor5 track, but also to the Reaktor5 instrument in that track. The MIDI Bus track has its output set to the next track, which has an instrument rack. That doesn’t tie up the MIDI from dropdown in the instrument rack’s track, so the track still accepts note and control information from a control surface or keyboard, or what have you. The other important point is to set monitor to “In” for your two target tracks. Maybe this is a well known workaround now but a year or two ago when I googled for solutions I found only complaints and no fixes. I hope this helps somebody else because it sure opens up possibilities for me! This entry was posted in Practical Reaktor and tagged Ableton Live, dummy track, MIDI, MIDI bus, reaktor, routing on December 24, 2010 by peterdines. I recorded a bunch of samples in a stone tunnel on Mt. Royal here in Montreal a while back – stomps, tin cans, bottles, plastic containers, sticks and stones and etc. clanking and knocking around. Here are some of them cut up into individual hits for your percussioneering pleasure. And here’s a beat I made with them, loaded into a new version of ParamDrum. The new version will be available this week as soon as I make a few more demo presets. Notable additions are: a sub bass control to add some extra oomph to your bass samples, and decay and sample-start controls. 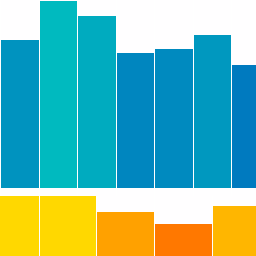 UPDATE: daaaamn, I have to stop working in headphones. The bass ain’t what I thought. I have to redo this with a better kick that kicks. This entry was posted in Downloads, sample pack and tagged drum machine, drum sequencer, Rhythm machine, Sample Map, Samples on November 8, 2010 by peterdines. Most binary file types just give you white noise if you try the old “open them in an audio editor” trick to make samples for Ryoji Ikeda or Alva Noto type tracks. However I’ve discovered that Reaktor ensembles lend themselves particulary well to this misuse and often sound extremely varied and unpredictable. Probably has something to do with the variety of embedded information – primary level structures, core level structures, samples, bitmaps and who knows what else. 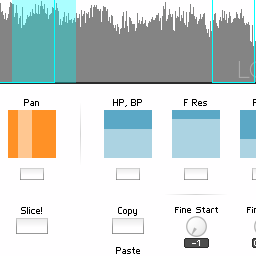 UPDATE: some more details on opening binaries in Audacity – FIRST, TURN DOWN THE VOLUME. Raw binary files like this can be as grating and ear damaging as anything Merzbow ever came up with. Careful with your ears and equipment. 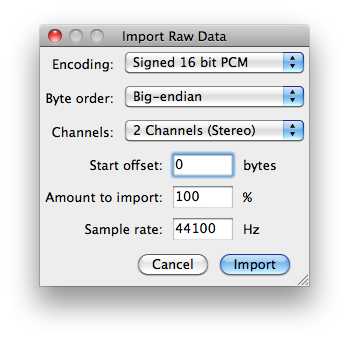 in the main Audacity menu, go to file -> import -> raw data, browse to your file, and open it. You will get a dialog asking for the bit depth, “endianness”, and number of channels. Experiment with different options but 16 bit stereo is a good start. This entry was posted in Uncategorized and tagged audacity, binary, raw mode, Samples, Sampling on November 7, 2010 by peterdines. Field recordings made in Nova Scotia with a Zoom H4. Good raw material for a granular sampler. This entry was posted in Downloads, Granular and tagged Samples, Sampling, wind chime on October 27, 2010 by peterdines. 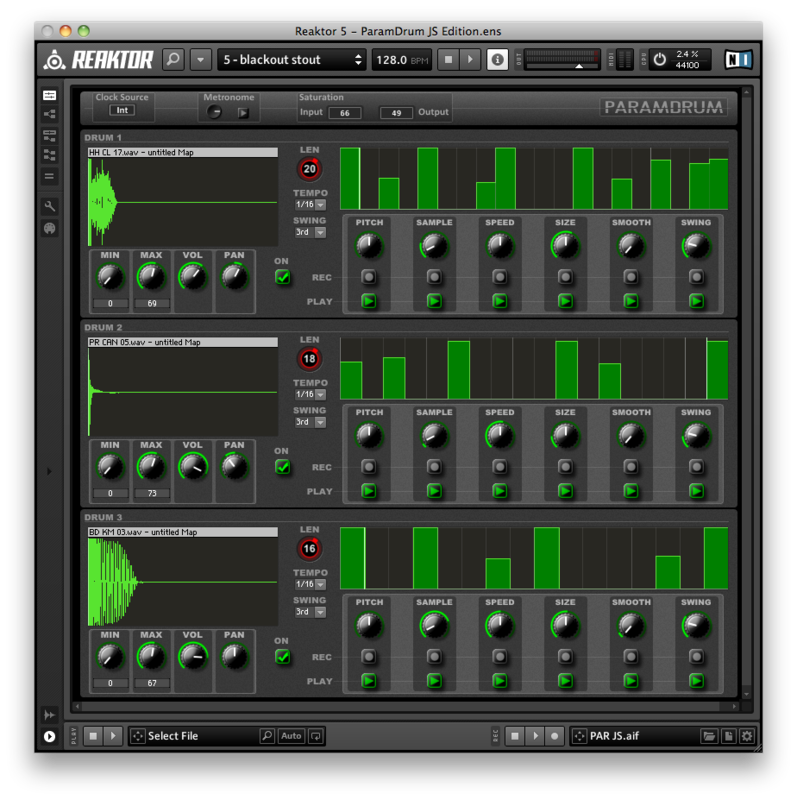 By popular demand, here is the new skinned ParamDrum with the new sample maps, now saved in Reaktor 5.15 so you can make use of it without upgrading to the beta. This entry was posted in Ensemble, ensembles, Granular, paramdrum and tagged drum machine, GUI, instrument, reaktor, Sampler, Sampling on July 29, 2010 by peterdines.